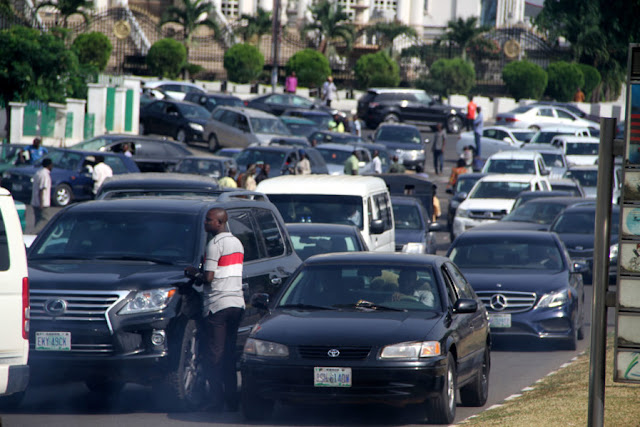 The Department of Petroleum Resources (DPR) on Tuesday sealed a filling station in Kubwa, a suburb of Abuja, for allegedly selling petrol above N145 and gave out the product free to motorists. The Abuja Zonal Operations Controller of the department, Mr Mohammed Abba, said the report about the station, Khalif Civic Oil and Investment Limited, was gotten on a tip-off by a good Samaritan. Also on the team was Dr Maikanti Baru, the Group Managing Director of the NNPC and Mr Aminu Abdullahi, Assistant Commandant-General, Operations, the Nigeria Security and Civil Defence Corps (NSCDC). ”The station had 6,000 litres of petrol. We got the call from a good Samaritan. When we came, we realised the station is illegal because it is not licensed and it was selling at N250 per litre. ”We instructed that the product should be dispensed free of charge. ”We will give them one month to come and regularise the licence, after that if he does not come we will hand over the station and the people concerned to the civil defence to prosecute,” Abba said. Abba added that ideally, the station should have gotten its licence before putting up the structure. ”That’s why we call it an illegal station. It is double impunity as if there’s no government in this country. ”Anyone that wants to build a filling station should, first of all, obtain a licence. This one did not follow due process,” he said. Baru, in his remarks, said ”this collaborative effort of the DPR, Civil Defence and NNPC is to identify stations that are erring in line with President Muhammadu Buhari’s directive for us as agencies to fish out those perpetuating the fuel scarcity. ”This was discovered by the DPR on a tip-off. Government is appreciative and wants Nigerians to come forward with such information on where products are sold above N145”. Also, the NSCDC Assistant Comptroller-General said ”what the DPR did is a welcome development but the illegality is criminality. “I have directed the arrest of the manager and the owner of the filling station so that action would be taken appropriately,” he said. The News Agency of Nigeria (NAN) reports that at the entry of the team into Byazhin area, where the station is located, shouts of ‘Sai Baba’ rented the air as DPR had already been dispensing the product free. NAN spoke to a motorist who confirmed that he got 20 litres of petrol free of charge. “I have been on the queue since 4 a.m. When I got close, there was a little commotion and we heard that they had started giving it (petrol) out for free. I just got it and it is true,” he said. A bike rider, popularly called ‘Okada’, could not contain his elation and continually chanted sai Baba, saying ”I didn’t pay. It’s good for them, they always sell at a high price always”. Another DPR staff member, who led the arrest, told NAN under anonymity that ”each car will get 20 litres free and each bike five. This is to stall those that would be tempted to get the petrol free and queue up again”. The team also made arrests in the city centre on Christmas day on another sting operation.